Optimizing all information on the Facebook pages: For a potential customer visiting your Facebook profile for the first time, only a few things about your company are visible – the cover photo, the profile pic, the short description that introduces your company. You need to create the first impression with these few elements. Choose a profile pic and cover image carefully. You must give a lot of importance to the description about your company. Your Facebook page should contain a lot of information about your company and the products and services that the company deals with. All the information you provide about your company will help your company appear in the search results when people search for a company like yours on the Internet. Posting engaging and interesting content is necessary: Different companies have different strategies when it comes to publishing content on social media pages. But it is suggested that in addition to your company information, you must include informative, interesting, and engaging content. You can post videos too for capturing the attention of the potential customers. Facebook is updating its algorithm to track the time period for which users are spending time at any particular page. Thus, keep your visitors engaged. Be active in your business page: Post regularly. The way you maintain and remain active on your personal profile and pages, you need to do the same with our business page. You need to reply to comments and posts on your business page. 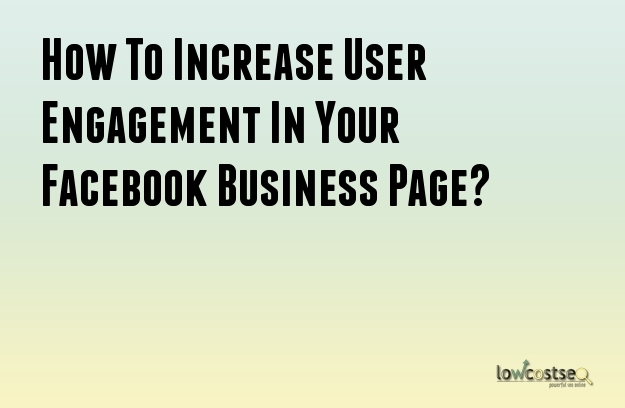 Moreover, you need to engage with the users, ‘like’ their posts, and answer their queries. All these actually help in engaging the potential customers to your business. Now, promote your Facebook page: Once you have lots of content on your page in the social media site, you need to promote the page everywhere – through your official website, signature of your email, footers of marketing emails, business cards, and various other digital marketing materials that your company uses. You can also spread words about your page to your friends, customers, and relatives. They might visit the social networking pages and engage themselves with the information that are present on the page. In addition to all that you can also link your existing communities and pages on Facebook with your business page. Doing all these will help in increasing potential customers for your business.